Swerve is a top-down free racing game in the spirit of the classic Micro Machines. Players may choose between solo and network multiplayer as well as going for a quick race, against the clock or a championship. Races are set in famous European capital cities such as Paris, London, Berlin and Rome, with some landmarks to be seen in the circuits. Each of the cities offers three tracks. Graphics are great while never getting too cluttered and the track design is interesting. The motion blur effect is clever but can be turned off for those who don’t appreciate it. 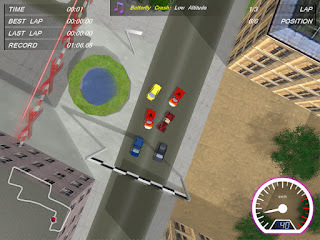 There are many options to customize the races, from the car selection (some are locked at the beginning) to the choice of difficulty for each individual car, number of laps and track direction. Swerve is a great and addicting game that deserves every arcade racing fan’s time.